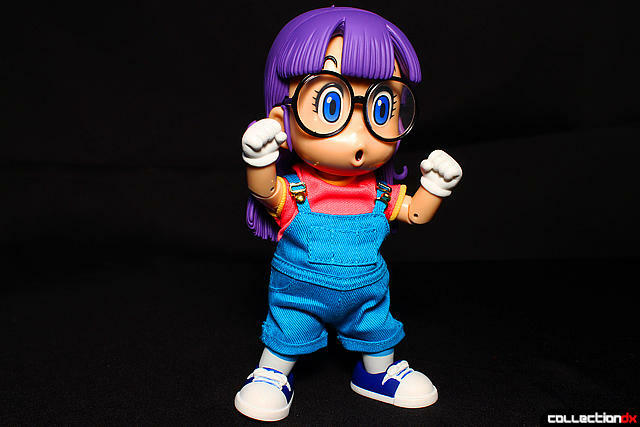 If you are not familiar with Arale-Chan, you may be freaking out wondering what a little girl's toy is doing on CDX. 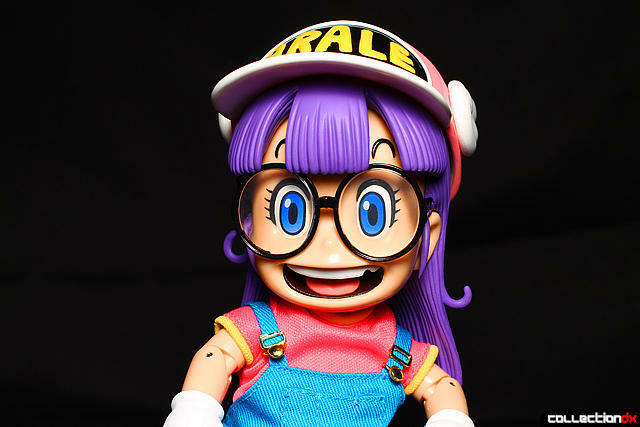 Arale-Chan is a robot, albeit a really cuddly big-headed one. 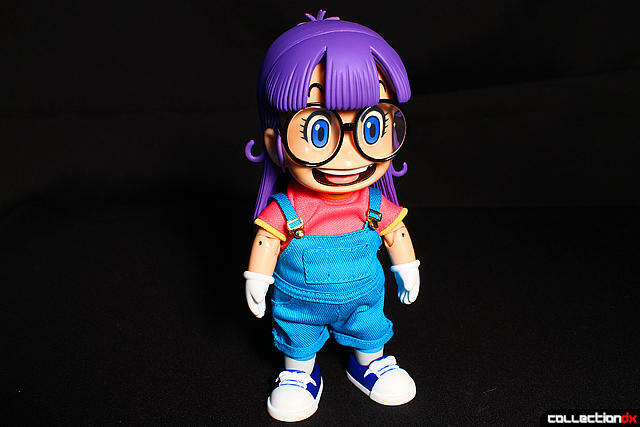 Arale-Chan comes from a very popular Japanes manga called Dr. Slump. 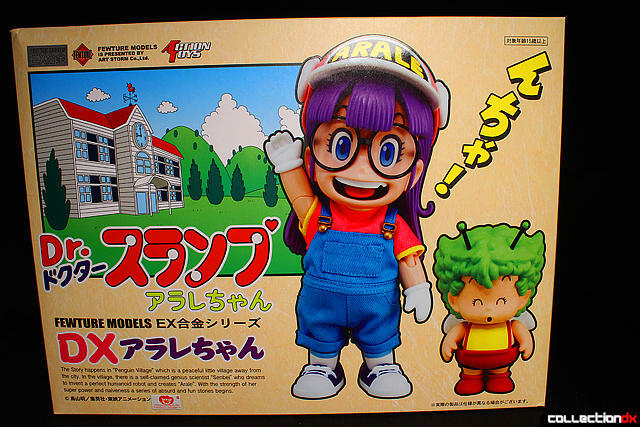 As a matter of fact, my very first review for CollectionDX was for another Dr. Slump robot called Caramel Man Gou 1. 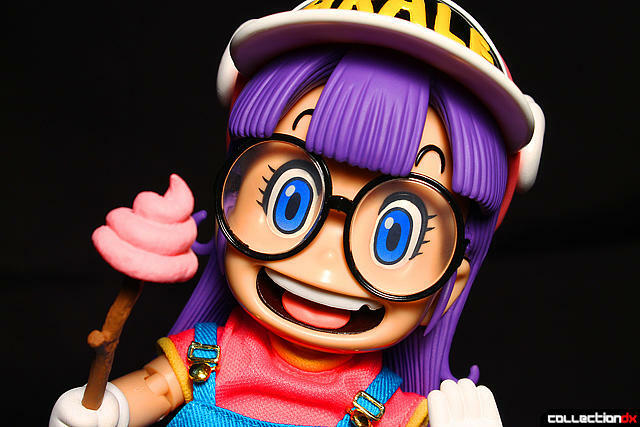 Arale-Chan comes to us from Fewture in the form of an EX Gokin release. Yes, the same EX Gokin that gave us those mean looking Mazingers and Getters. High end toys usually come in high end boxes. While this is not encased in your standard EX Gokin sleeved box, it does have a nice satin feel with the characters glossed and embossed on the colorful box. 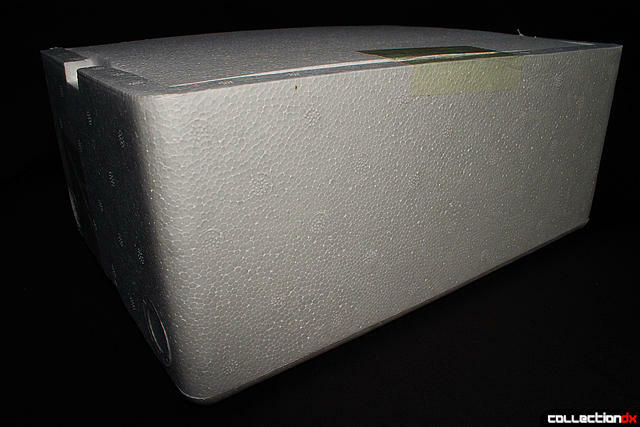 While some companies are reducing and/or plain eliminating the once standard Styrofoam tray, Fewture continues the tradition of using incredible amounts of said material to pack this set. 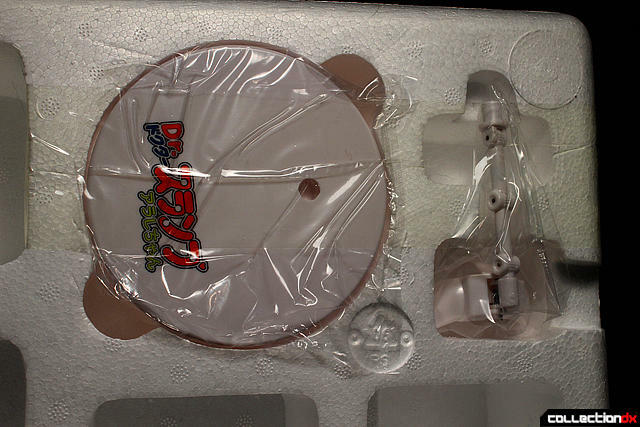 Housed in this tray are the figures and all included accessories. 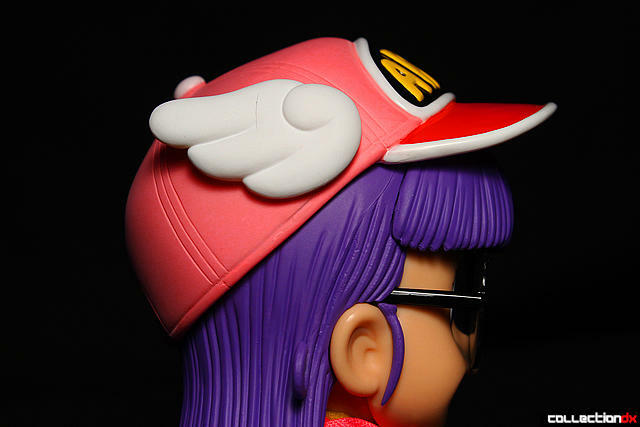 Flip it over and you will see the included stand with Dr. Slump screened logo. 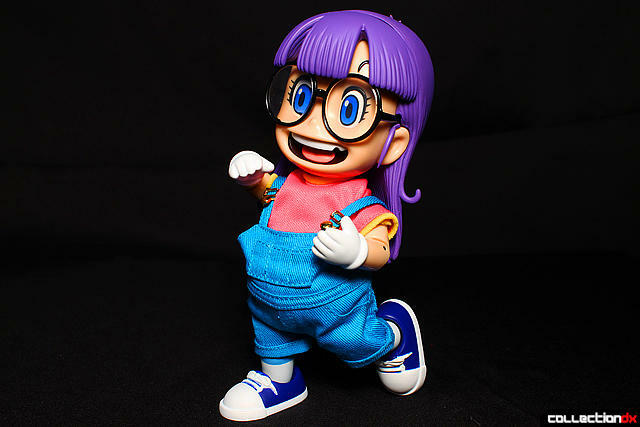 Once Arale-Chan is removed from her tray and plastic wrap, you can really appreciate how nice this figure feels in the hands. There is diecast to be found here, folks. Unfortunately, it is in small amounts. Mainly her underpants and lower legs, Here she is striking a neutral pose with her included lensed-glasses. 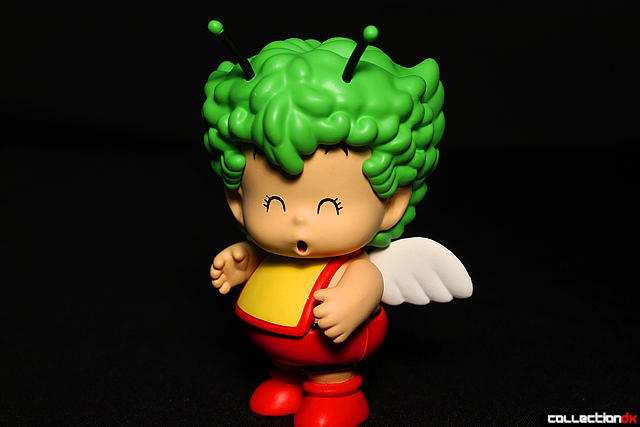 Also included is Gatchan, who is a little cherub-like creature. 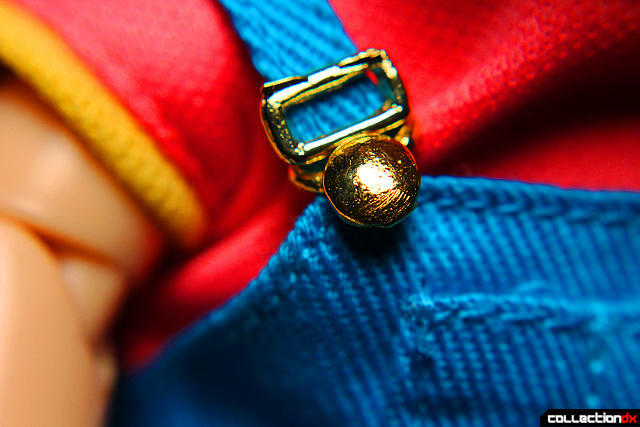 He/She is also laden with diecast goodness in its torso. 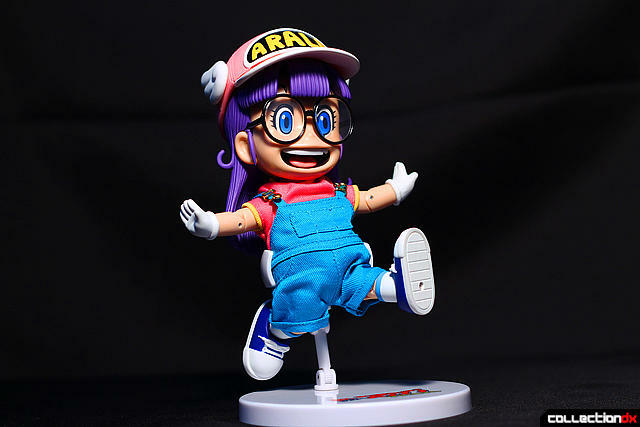 Arale Chan is quite poseable. This figure offers up an impressive amount of articulation points for a figure of this design. You would expect this toy to do basic poses, but it goes just a bit further than expected. 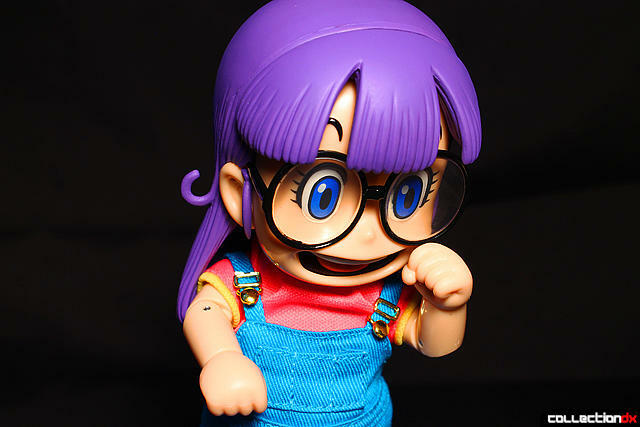 Gatchan is also articulated but not to the extent Arale is. Gatchan has only head and arm movement. Included in the accessories is an optional face with a smaller mouth. 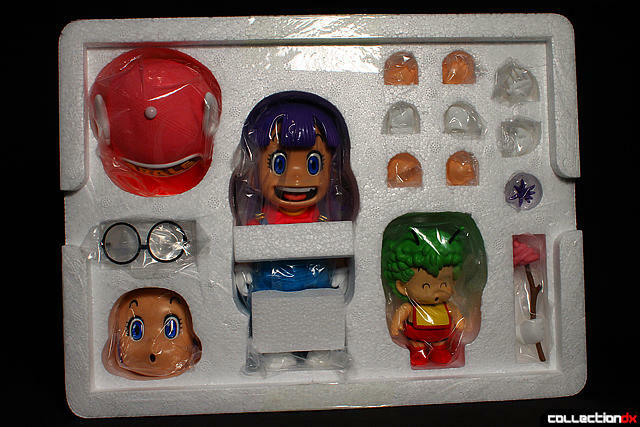 The faces attach easily to the head using a magnet behind each face. Also shown is one of the optional pairs of hands. I love the attention to detail in this figure. Just look at the suspender buckles. 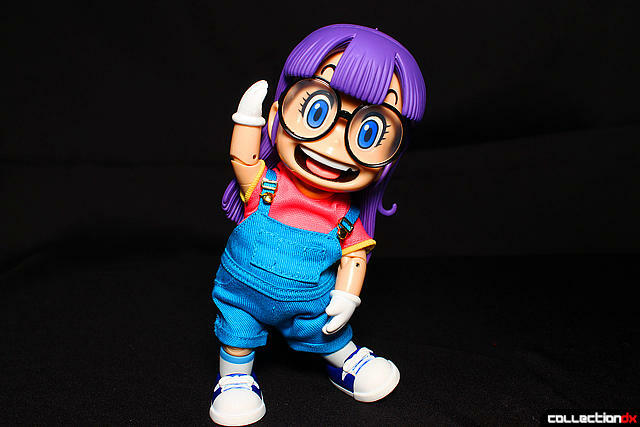 Her overalls are done in a very vibrant blue cloth and feature a nice pink shirt tucked behind them. Although the figure doesn't have much in the way of complicated detail, the paint apps are very sharp and well done. She looks like she popped right out of the screen. Aside from the various included optional hands, she also has these ungloved hands. 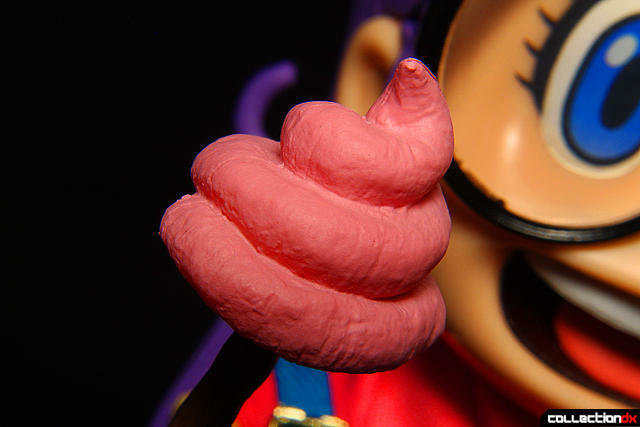 I don't know whether to be proud or weirded out, but this will be the second figure I own that included a pink poop accessory, or "Unchi", if you will. Even up close you can see the poop-like texture minus corn detail. 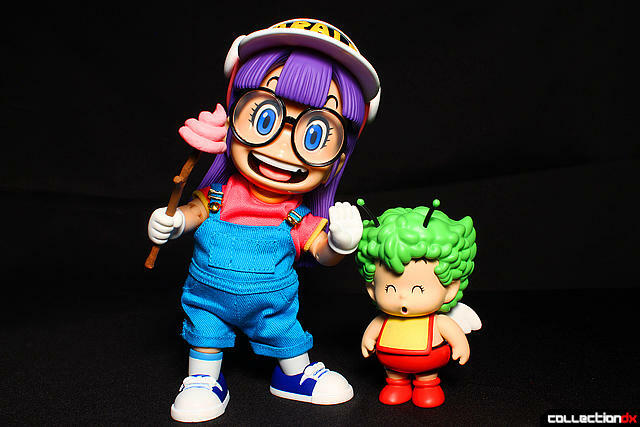 Although Arale-Chan stands fine on her own, she does come with a nice stand. It features three ratcheted articulation points and a spring-loaded seat that clamps around here. While the stand is sturdy, she falls over at times when one of the ratchets give out due to her heft. Careful adjustment will eliminate any topples. Using the stand allows her to pull off some signature moves. This is most obviously not for everyone. I liked it because of its execution and quality, but its appeal is understandably limited... at least here in the US. Especially when you realize that it's not cheap. This figure didn't last long in my hands since my wife has now laid claim to the set. She now resides with my wife's Robocons, Drossels, and Hello Kitties. On the other hand, very nice nice review of a very expensive and odd figure. The crazy hat, different hands, and Gatchan definitely make this figure pop. 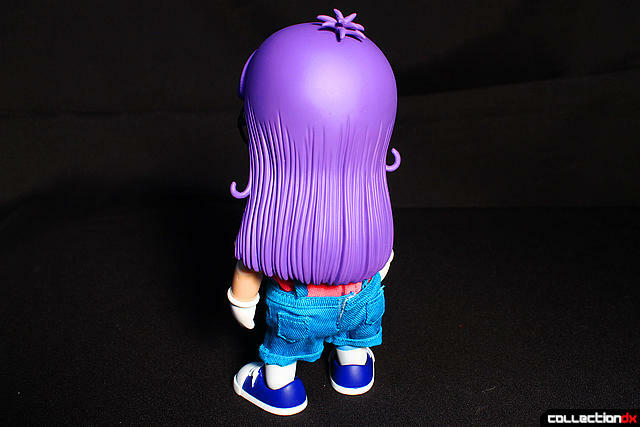 "This figure didn't last long in my hands since my wife has now laid claim to the set. She now resides with my wife's Robocons, Drossels, and Hello Kitties." 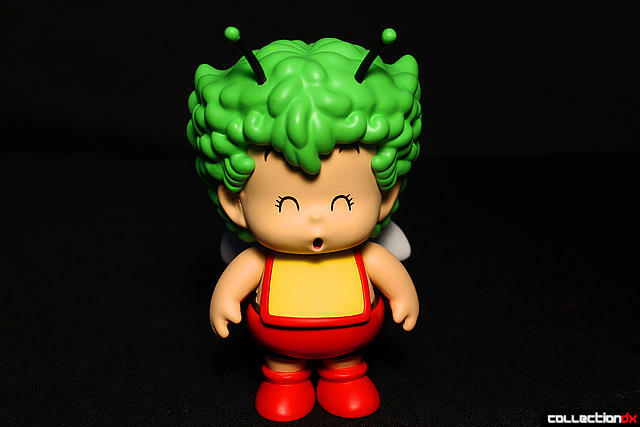 New model coming out with The Cat ear Cap and raygun and Kitty Gacchan.I'll pick up one of them I have the Toryama and it is a top quality gokin figure. Im glad you review some of the non shonen figures like HoiHoi they are a lot of fun. 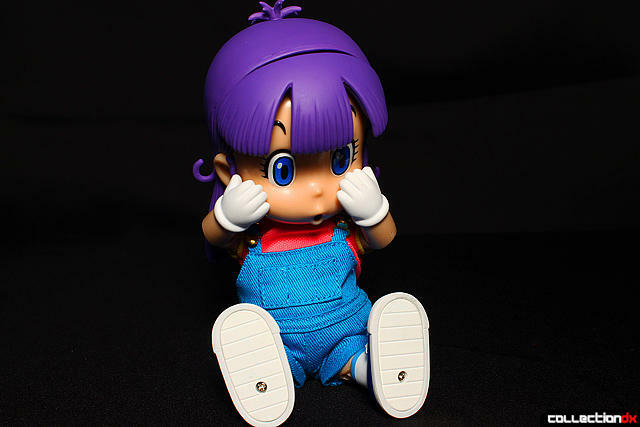 I need to pick up one of the Popy Arale Chans I see them in the 3500 Yen range. Great stuff.